By a wide margin of 30-1 (plus 1 abstention), CB3 voted on Thursday night to disapprove the proposed "Willets West" mall / Willets Point development, according to Willets Point United. The landslide vote endorsed the earlier recommendation, on Tuesday night, of several CB3 committees, and took place after a public hearing on the matter. Reasons for CB3's disapproval include the project's huge and unaddressed traffic congestion and related negative impacts, failure to prioritize housing and a school, overcrowding of subway and bus lines as a consequence of the project, and disregarding the Advisory Committee and Queens officials when selecting the plan and the developers. CB3 concluded: "The proposed project would change the character of the surrounding neighborhoods and impact the livelihoods of 250,000 residents and many small mom-and-pop businesses." Likely aware of the committees' Tuesday recommendation to disapprove the project, no representative of developers Sterling Equities and Related Companies, or the city, bothered to attend the Thursday night public hearing. Although CB7 voted last week to approve the same development project by a very slim margin of 22-18 (notoriously, after the CB7 committee had rejected it the week before by a vote of 7-2), the city's Uniform Land Use Review Procedure ("ULURP") entitles other affected community boards to also evaluate a land use application that "may significantly affect the welfare of the district or borough served by such board". CB3 has exercised that right, and decided to disapprove the application. 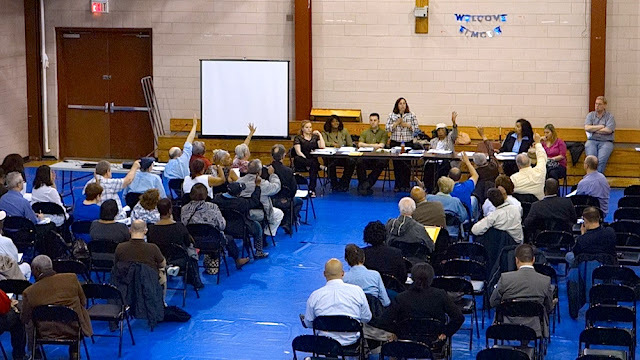 So at the moment, the Willets West mall / Willets Point development has been approved by CB7 by a very slim margin, and rejected by CB3 almost unanimously. ULURP does not give any greater weight to any particular community board's recommendation – so both boards' recommendations must be equally considered by the next decision-makers.